Home / Updates / Schnucks Shoppers! 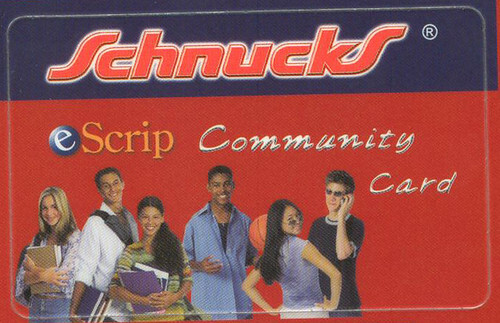 Pick up an eScrip Community Card at Schnucks today! Schnucks will contribute up to 3% of your purchases to Missouri River Relief everytime you shop and swipe your card. Signing up is simple! Click here for more info. Each month, Missouri River Relief earns money from the eScrip Program. Currently, Schnucks contributes to Missouri River Relief each time your family makes a pruchase using a Schnucks eScrip Community Card. There are no receipts to collect, no vouchers or certificates to buy, no hassles for you - and every purchase counts. 1. Visit Schnucks and request an eScrip Community Card. 2. Activate your card here to sign up online, or by calling 1-800-931-6258. It only takes a few minutes. From then on the money rolls in when you shop & swipe - automatically! 3. Present your card to the cashier every time you shop at Schnucks. For every dollar you spend, Schnucks will contribute up to 3% of your purchase amount. There are over 60 stores in St. Louis, and one in Columbia, Jefferson City & Washington, MO.